Oops, I Craft My Pants: Craft Wars!! So, TLC/Discovery contacted me and asked if I wanted to do a short interview with a couple of the judges, I kinda flipped out a little, because oh, the knowledge I WISH I HAD! I had to jump at the chance to ask a few questions that will help me grow in my crafty endeavors... Stephen Brown and Erica Domeseek shared some WONDERFUL advice and some hilarious stories of their adventures in making stuff! Click through to read more and learn some stuff you aughta know! Kira Nichols: How did you begin your adventures in crafting? Erica Domeseek: I've been crafting since I was a kid. I have DIY in my DNA. From an early age I spent summers at camp crafting, which then led to an early career as a prop stylist in the Fashion industry. Making things is simply apart of my life, I cannot imagine not doing something creative every single day! Stephen Brown: I can't remember a day in my life when I wasn't crafting something. While other children were being cautioned not to sit to closely to the television set, for the fear of it ruining their eyes...I was being rushed to the emergency room to get glitter out of mine...and I will just tell you, that chunky glitter in your eye is a much quicker route to blindness than your proximity to watching The Brady Bunch! My first real adventure in crafting was in first grade when our teacher handed out construction paper Christmas trees along with unpopped kernels of popcorn for us to glue on for decoration. But just as we started to craft the fire drill bell went off and we were told to line up single file and exit the building. Not wanting to stop crafting, I was the last out of my seat and the very last one in line to leave the building but instead of exiting I decided to run back and finish my popcorn Christmas tree, not in our class room, but in a coat closet. When everyone returned, I was no where to be found and I ignored everyone's calls for me until my creation was completely done, but by the time I was finished...It was too late! The kids were gone and only my teacher and the police remained. I'm happy to say that was my last run in with the law, but only the beginning of letting crafts influence my decision making. KN: What is the craziest thing you've made (and were super proud of!) that other people didn't really "get"? ED: One time I did an amazing DIY trench coat on the site that was inspired by a Burberry trench coat that graced the runway. It was all gold spikes, but instead of using gold spikes I had this crazy-genius idea to spray paint chopsticks and glue each on on. This project took so much time, I was so proud of it... but it was kinda crazy... I mean, who is really gonna spend time to gluing all of these chopsticks? Let's be honest, that's a whole lot of Chinese food delivery! SB: "Whats the craziest thing I've ever made?" I'm assuming thats like asking someone "How are you?" and what you really want to hear is just a quick answer like "I'm just fine" not the details like "my leg hurts, my dog died, etc." because I'm not sure I could answer this quickly. Theres also defining "Craziest," there are lots of things I make that seem outlandish to others but are perfectly plain to me...which is a lot like the old saying "Whats normal for the spider is terrifying to the fly!" One example might be an opera production of Cinderella for which I designed the costumes. My designs for one of the stepsisters called for a Marie Antoinette style wig dressed with an elaborately handcrafted model of a hot air balloon...containing a real balloon that Cinderella could pop onstage with a hairpin from her own wig (that I thought would add some much needed humor to opera) The fittings for my over the top creation went very well on the delicate opera singer (who was the daughter of the most famous violinist in the world) and she said that other than it being painfully heavy, unbalanced and smelling like glue...she loved it. Well....on opening night, I thought to myself, wouldn't it be fabulous if I filled the balloon with glitter, so when it popped, sparkle would go everywhere, creating a dazzling effect! It never dawned on me that when the balloon was pierced that the glitter would fly everywhere, the singer would inhale it into her lungs and nearly choke to death there on the stage...in an opera that actually is not suppose to have a tragic ending! Anyway...that aside, I would take those same risks again, for the review that read "Stephen Brown's Crafty Costumes were absolutely brilliant!" Once again I chose my love of crafts over the safety of others. KN: Did you have a specific moment when you realized you wanted to make a life and a career out of creating things? ED: I'm pretty blessed that I have been able to craft a career, and it found me, which is the best part! There was a moment when my "craft club" comprised of my best friends, gave me the idea of launching a blog, which then led to a best-selling book, when then parlayed into a DIY brand happened organically. I knew that this was my calling- there was nothing else that I could imagine doing. I am in the business of delivering smiles and crafting is the way we do it. I cannot think of a better career that emboides who I am. The fact that my career mixes my passion for style, art, and empowering people with DIY is still surreal! SB: I don't think it ever occurred to me that there might be other career paths that didn't involve making things. Sure, I also imagined my self on TV or in my own Broadway show (something I have not given up on) but I fully intended to create all of the sets, costumes and puppets that this endeavor would require. And I have to say, other than the short time I was accidentally employed as Mel Tormes body guard, all of my jobs have been in some creative field...and even my short stint as Mel's security required some craftiness, just a different kind. KN: What advice would you give to small-time crafters who want to take their hobbies to the next level (i.e. product lines, reaching a wider audience, etc.)? ED: The best advice I can give is find people who have done what you're looking to do. Seriously! Look for mentors who can provide you with helping guidance, introductions and advice. When you're trying to expand your hobby and take it to the next level, be sure to surround yourself with supportive people who provide you with the tools (no pun intended) for growth and success. Best advice I have ever recieved was, "Talk once, listen twice". Great advice is golden... get it! SB: There are many different kinds of crafters, ranging from those who do it simply for relaxation and the joy of expressing themselves, to those who do it because glitter and glue sparkles through their veins. If they consider themselves as the latter...then they should make a plan of how to move their glitter forward. The first step is to develop a style that truly defines who you are as a crafter and explains your point of view. If you do this and your unsure, than you should repeat step 1. Example: I love Glitter so I created a magical place called Glitterville....I also love Chenille but Chenille-ville didnt offer much opportunity for growth once I had made everything I could think of using a handful of pipe cleaners...so pick a name that will allow you build upon your current vision. Step 2 Is to come up with a name and (you may think its early for this) create a logo for yourself. People believe in you much more when they know your name and recognize your brand. After all, you are much more likely to approach a dog with a name and a tag than one standing unidentified in a pack. Step 3 Packaging is important. You can have the best craft in the world...but if you don't deliver it to the customer in a unique way, your efforts could possibly be waisted...at the same time...you could have a really crappy craft and have huge sales because of your cute packaging...try to have both! The best craft and the best packaging. Step 4 If you have followed this guide for "Building your own Craft Empire" then you must realize that the next step is sales! This process is highly subjective and I can only tell you what worked for me. Instead of pursuing the normal craft fair route, I decided to approach small stores that I could sell the Glitterville dream to...and convinced them that having my glittered goodies on their shelves could in fact "Make everyday a holiday!". After one season of selling to stores, someone suggested that I try showing my things at the wholesale market in Atlanta called AmericasMart. This is where all the stores in the whole world go to place their orders. So by that July, I was positioned firmly in a temporary 10x10 booth taking orders for my wacky wares. It was here that my work was seen by important people in the press including Country Living Magazine and Mary Englebreits Home Companion, who search the show looking for new artist to feature...and the rest is craft history! Today Glitterville's presence is world wide with thousands of products for holiday and everyday. My new book "Glitterville's Handmade Halloween" hits bookstore shelves on August 21st and the biggest news of all is that I'm a judge on "Craft Wars" premiering on TLC on JUNE 26 hosted by Tori Spelling! Oh yeah...Step 5. 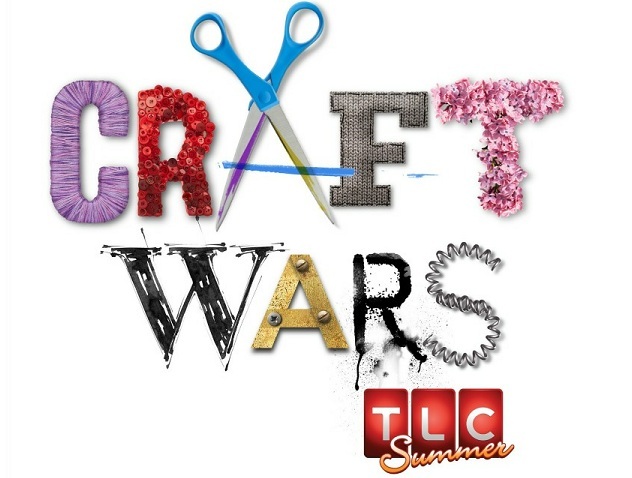 Watch "Craft Wars" on TLC and see how your crafting skills compare to these crafty competitors! KN: Thank you SO much, Erica and Stephen for sharing your experiences and wisdom! "Craft Wars" airs on TLC Tuesday nights at 10/9c. Check out this sneak peak! Fab interview! I'm looking forward to this show too and hope it's as good as it is in my brain. EEEEEEEPPP!! How exciting!! I haven't read through the whole interview yet but I will be shortly. I would have fainted to even type questions to them :). You should apply for the show, Kira!! You would be amazing. I'll be watching tomorrow, for sure!